I am not able to charge my BOLD 9700 unless it is connected to USB to PC/laptop. I brought the problem to my carrier, after trying different battery and multiple wall chargers (and multiple walls); they changed out the phone. Now, I have new phone with same issue. When I plug the unit into the wall I see the bolt to indicate that it is charging, but 5-10 minutes later it changes to a plug but the battery is nowhere near full. Anyone else having this problem...thoughts..suggestions...HELP!!! I've left it overnight twice and woke up to a dead phone. Have you tried charging in totally different locations (say, home and at work)? That's bizarre...never seen that before on any BB...and it charges through a USB port on your PC?? Is it possible that your charger (connected to the wall) is defective? Have you tried with a different wall charger? That was my initial thought, but the OP said he tried a number of wall chargers (and outlets). If you are using a wall charger with a USB cable attached, make sure that it is a charging cable and not a data only one. Really? I never even knew there were 2 variants of these cables...wow, I learned something new!! Best thing to do is to use the Official BlackBerry Travel Charger included with your 9700. The worst thing to do is to use a "powered USB socket" type charger of the LOW-OUTPUT/LOW VOLTAGE variety, as they don't provide enough juice to charge the 9700. Let me explain further. ...which I use when I'm, surprise, surprise, traveling! As you can see, it gives 3 surge-protected outlets, plus 2 powered USB ports, into which you can plug USB cables for charging your cell phone, Bluetooth headset, MP3 player, Nook or other eBook reader, etc, etc. The idea being to leave your bulky chargers at home, and just use this as the charger for 2 devices, which I was able to do perfectly fine with my old Curve 8900, and also with my fiancée's 8530 Curve. Plug in a micro-USB B cord into the surge protector, plug the micro end into the BB, and it would charge... until the 9700. When I tried it with this phone, I got an on-screen message saying that the charger did not provide enough power to charge my phone! That's when I found out that there are LOW-OUTPUT and HIGH-OUTPUT models of powered USB ports. 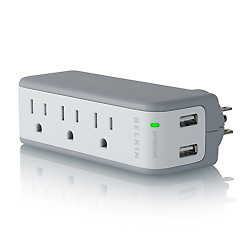 Belkin needs to make an updated model with HIGH-OUTPUT ports, that would solve the problem. Until then, I still have to carry & use the travel charger that came with my phone, even though other models of BlackBerry have no issue with the low-output powered USB ports. Last edited by Jack T. Chance : 08-17-2011 at 03:04 PM.